A celebration of cycling’s most ubiquitous - and storied - piece of kit. Tom Simpson of Great Britain wearing the rainbow jersey at the start of a stage in the 1966 Tour de France. The jersey is one of two that Simpson gave to the author’s mother in 1966. When I was growing up in the 1960s and early ’70s in a coal-mining town in northern England, my friends had pictures of soccer players on their bedroom walls. They supported players and teams—England’s 1966 World Cup team, the Manchester United of Best and Law—with partisan gusto.I didn’t talk about a team incessantly. My bedroom didn’t have pictures of soccer players. I had pictures of cyclists.Tom Simpson was my uncle. He was the first Brit to wear the yellow jersey in the Tour de France and our first professional world road race champion. Tom was a big part of our lives. He is still my hero, 50 years after his death at the age of 29 in the 1967 Tour de France. That’s why I read nothing but cycling magazines as a kid. I felt connected to the riders because of Tom. They looked so stylish. The colours they raced in were bright and well-matched, and printed with fascinating foreign names—none of them household products I could find in South Yorkshire. I fixated on these jerseys because they came to represent the riders who wore them, who raced with such bravery, vigor, and dignity. 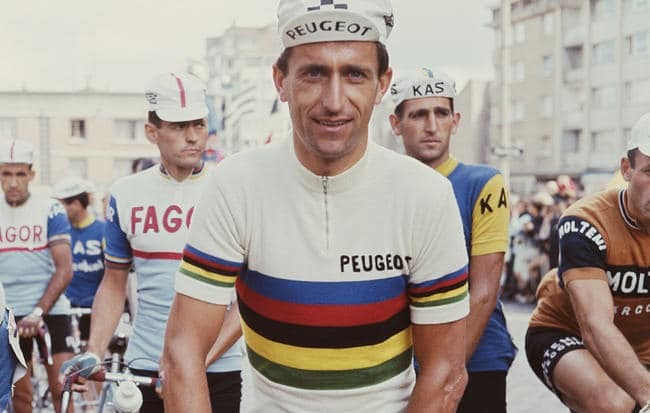 Even in the earliest days of cycling, great riders made jerseys famous. Like the plain kingfisher blue of Alcyon, worn by 1909 Tour de France winner François Faber. At 92 kilograms, the “Giant of Colombes” was the heaviest rider ever to win the Tour. The bold green and maroon Legnano jersey worn by Gino Bartali, who won the Tour de France in 1938 and 1948. Those victories were separated by World War II, during which Bartali, at his own risk, worked with the Assisi Underground to save the lives of many Jewish families. Then there is the famous Bianchi celeste: According to one legend, Edoardo Bianchi created the blue to match the eyes of an Italian queen, while another story holds that it was inspired by the band of sky above a Milanese sunset. RELATED: What’s the Fastest Bike Colour?